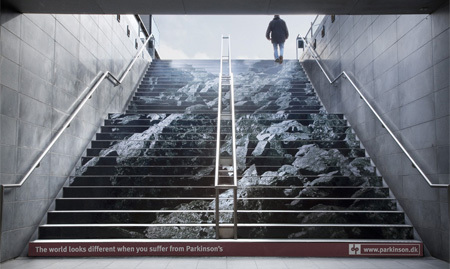 See what happens when companies use stairs to advertise their products. 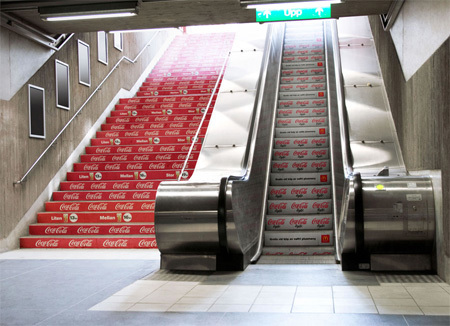 Coke Light was advertised to people using the escalator and regular Cola to those who chose the stairs. 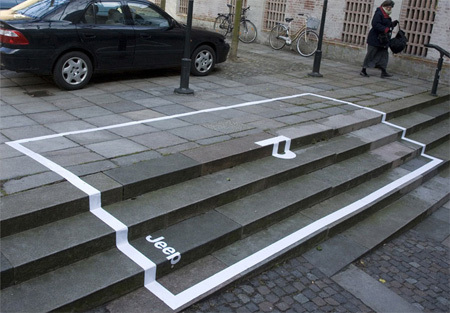 Clever parking space on the stairs reserved only for Jeep cars. Creative campaign created to generate book donations for the Greenville Literacy Association. 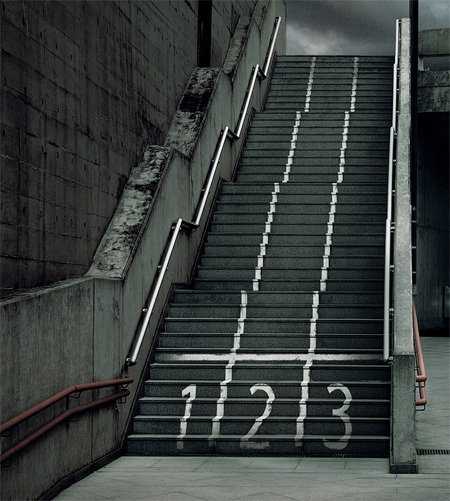 The stairs of the main shopping mall entrance were transformed into a track that extends to the central entrance. 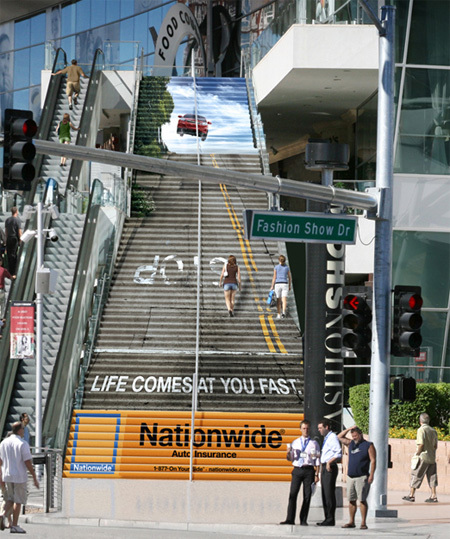 Nationwide Auto Insurance: Life comes at you fast. The world looks different when you suffer from Parkinson’s. You cannot imagine what it’s like to compete everyday of your life. Sponsor and support handicapped athletes. Clever stickers were strategically placed at selected stairways around the city to promote Ogawa’s first class massage. the ikea one is kinda clever. The Jeep parking space is my favorite. What a clever way to promote the Jeep lifestyle. 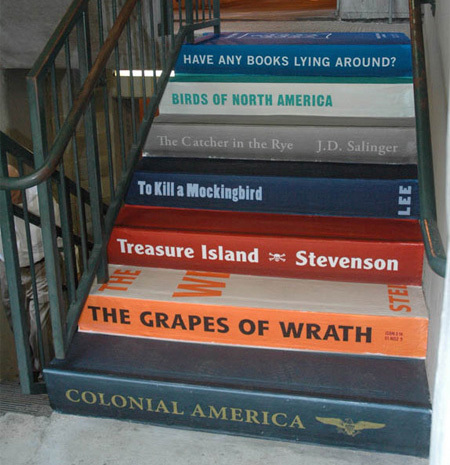 Literacy Association staircase it intense. One of my fav. great American novels is on there. Salinger. Then the IKEA stairs… simple and awesome use of the environment! Great post. Yep, the Jeep one owns them all. 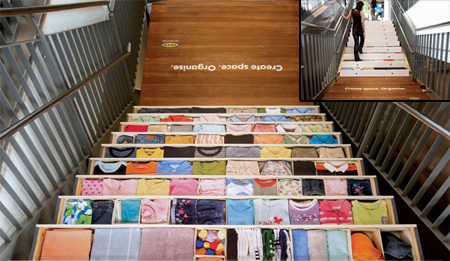 Great idea since most people will be looking down when they use stairs, but something about the Ikea one makes me think it would be too easy for people to loose their step. Maybe it’s too busy with too many color transitions to be safe. The Ikea concept won at Cannes last year didn’t it? The Jeep ad is cool, but has numerous variations for different brands. IKEA stairs are the best! I also think that athletes’ staris are great. 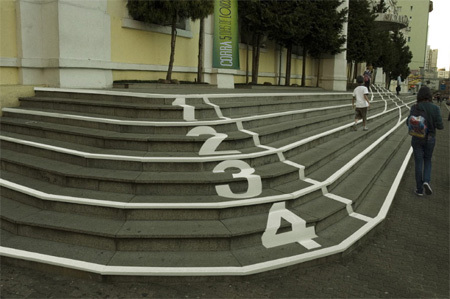 I just want to run, just take part in competition with other pedestrians! Im not sure the Jeep ad is so clever after all. What does it say actually: you can be irresponsible an park where you want?, or go and get yourself a parking ticket? People probably do buy SUVs to reign the urban area and be able to park on stairs, sidewalks, bicycle lanes etc. But its just wrong: it perverse that this vehicles are being used in the city, but being designed for the off road. And finally: does this ad help the Jeep brand? Think about it, in my opinion it doesn’t. i love the jeep one… great…!!!! Ikea is the most creative, imo. Back massage also an eye catching ads. Nice post. there is one on the piano stairs. should be up here. wow its amazing i love your site !! !